Well, this time last week I was feeling quite nervous and under-prepared for Chicks in the Sticks at “Karingal” in Mt Cotton. 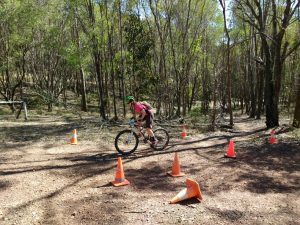 This was my second foray into Chicks in the Sticks, a women’s specific mountain bike event hosted by RATS Cycling Club south of Brisbane. Last year I put a reasonable degree of effort into my physical and mental preparation for this event. It was my first ever attempt at racing, and when I crossed the finishing line I was pleased I’d had a go. Only I knew what internal obstacles I’d had to overcome to actually register and show up on the day. So the fact that I was there, and finished the event, was very satisfying. The thing that left me somewhat disappointed was how AWFUL I felt nearly the whole race. 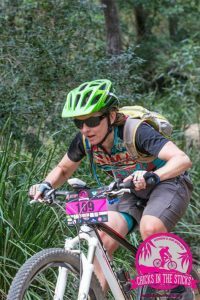 On the physical side there were the cramps and nausea right from the start, and mentally I was hypervigilant about the other riders around me and fearful that I’d mess up on the technical features. When I finished I only felt relief, and no great desire to repeat the experience. 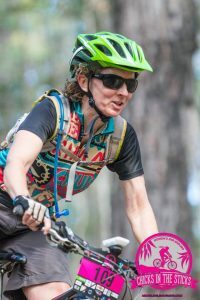 After some time to reflect I became determined not to give in, not to let this beat me, and I had a strong sense that I needed to go back to Chicks in the Sticks this year with a new goal of finding enjoyment in the process of racing. Feeling grossly underprepared this year through a lengthy series of “life events” (you can read about it here), I had little confidence in being able to ride long enough, hard enough and well enough. On arrival last Sunday I could feel my stomach churning and my inner voice telling me all the reasons why I couldn’t, shouldn’t, oughtn’t to be doing this. Race face caught by surprise! walked around the event village and chatted, I could feel myself relaxing and finally looking forward to the race. And then we were off! I found the start of the race less congested than last year which helped me settle into a rhythm much quicker. I monitored my heart rate and slowed down whenever I noticed it getting too high. I sipped water at regular intervals. I was aware of myself in my surroundings and had confidence in my ability to pull to the side and let the faster riders go by without having to stop completely and then take off again. 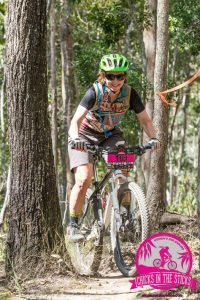 I also had confidence in passing slower riders when it seemed safe, and I chatted with other riders and marshals as we passed each other and joked with the photographers as they randomly appeared out of nowhere to capture that ever-so-flattering race face photo! I chose several B lines even though I knew I could ride the A lines. And I didn’t pay out on myself for my choices. At the 2 hour mark I was ready to finish the race. The legs were burning and the saddle was making its presence felt. But I kept going for the full 3 hours and made a concerted effort to smile and chat even more. I sang to myself as I climbed the hills, and told myself how awesome I am as I floated over the technical features. I could feel myself riding strongly and confidently. I knew I could do it and it felt good to stay relaxed. On my second last lap I had a quick stop for more water and felt a bit disturbed when another rider had a nasty fall. It could have been me. It could have been any of us. 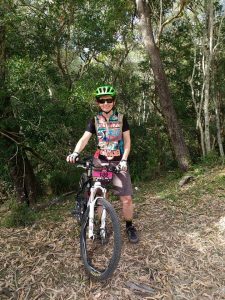 I rode more mindfully after that, knowing that I was getting tired and this is when accidents are more likely to occur. On my last lap I wriggled my right toes which had been feeling numb through the race and then the cramp struck me! Repeatedly! But I kept going and was able to laugh it off without falling off! Hmmm…. I thought ….. maybe I didn’t get my nutrition and hydration quite right! But I didn’t care. I hadn’t felt nauseous at all so I knew I’d done better than last year! I breezed past the timer as I finished the race, feeling really good. In fact, elated! Wow that was so much fun! 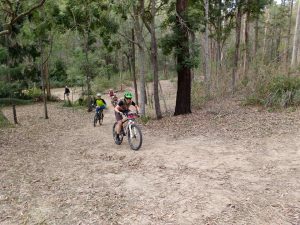 I’d ridden way better than I expected, not freaked out about the logs of death, the stairs, the steep gully, the log rollovers or the other riders. I knew I’d ridden smoothly, was aware of my limits, and had adjusted my riding to keep on keeping on. And best of all, I still had a smile on my face. Not a fake smile – it was a genuine smile from my heart. I’d actually had fun in a race! Who would believe it? Progress can be measured in so many different ways. Stats can gauge our outcomes over time, but let’s remember that not everything shows up in the numbers. I’ve made a huge mental shift from 12 months ago even though I hadn’t prepared for this event. Yes, I improved my time over the same distance. But I also rode smoother. I could feel it. There was a sense of flow with my improved skill level which contributed to my confidence as well. And the fact that the element of FUN played a major role on the day says it all for me. If I can have fun at this thing called mountain biking, then I’m definitely dealing with those demons that hold me back in life. That’s what I call progress!